Just over 10 years ago at our wedding, Steve and I each read a poem to each other. His choice was a Gary Snyder poem. It was not the one above but I’ve always enjoyed Snyder’s work, and this morning I went looking for explicit and yet roomy words to evoke the calming influence that an hour or so next to a tended fire (i.e. campfire, or hearth fire) can instill. This poem touches on that but goes further and captures more of the wonder experienced on our trip. 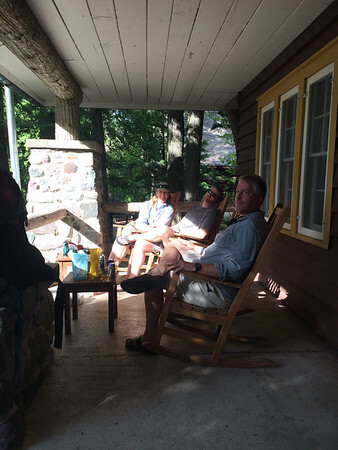 A prelude to my rediscovery of campfire: At the end of last summer’s road/camping trip we realized -in the drifting scents and sounds from a neighboring Itasca campsite’s fire- that campfires are a brilliant invention: great bug repellent, a greater dessert manufacturing appliance, and the greatest way to lose track of time -and score relaxation benefits – while traveling. To stare into it, enjoying the heat was divine, a terrific reason to go to bed late and a great prescription for sleeping well. How did I forget this, after all my years of adoring summer camp as a kid? Our camping of late, in comparison, often seemed a mad rush to get tent set up, stomachs filled, and tired bodies crammed into sleeping bags, in order to rest sufficiently for the next day’s plans. This didn’t always work so well: the pattern needed more ritual, and more space. For most of our trip out to Oregon and back last summer, fires were banned due to dry conditions. Fortunately on this summer’s trip, aside from one backcountry night, fires were permitted. So, we were able to experiment with last year’s revelation! What also helped: a) my brother Mike is a pyromaniac, b) he brought s’mores fixins and c) Steve has some serious fire-starting and -maintaining skills! This is not a big surprise given his outdoorsy dad and his scouting years, but nevertheless it was a new discovery for me. And on year ten! Reason for the trip: all of us (me, my hubbie, my brother Mike & his wife Laura) were celebrating our ten-year wedding anniversary, in June and July this year. The four of us had a great time hiking in the Grand Canyon four years ago. 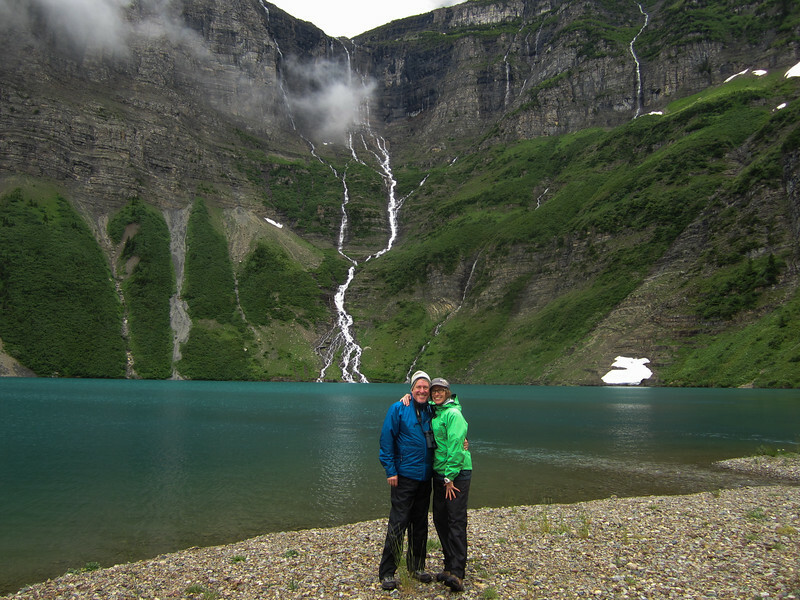 So, a year or so ago we decided to celebrate 2016 and our love of the outdoors by planning a weeklong trip in Glacier National Park and Waterton Lakes Park (the same park, in adjoining Canada acreage: an international “peace park”!). This was a park in which most of us hadn’t spent much time. And it was guaranteed to not get anywhere near as hot as Phantom Ranch. As we approached our trip time in July, Steve and I decided to get there via car, though train or plane were options. Owning a still-relatively new Mini Countryman meant that road tripping would be fairly hassle-free. What also aided our decision: air travel is no fun any more and Steve has a blessed abundance of free time. So: we planned on a road trip, tacking on 2-5 days on either end to cross the middle area of the country, from Minnesota to western Montana. Day 1: Meet in Helena then spend the night at a hotel in town. Good fun: a pub/taproom crawl. We visited Ten Mile Creek Brewery, Lewis and Clark Brewing, and Millers Crossing pub — plus a great wine bar (The Hawthorne Bottle Shop and Tasting Room) with a fantastic charcuterie plate. Day 2: Drive up to Waterton Lakes National Park, and check into Prince of Wales Hotel. Spend part of the evening getting gear selected and packed for our 3-day backpacking trip; spend rest of evening -and week- eating & catching up: we don’t see each other very often! Day 3: Take the ferry south, into Glacier National Park, and set out from the Goat Haunt Ranger Station. Hike ~7 miles, with 1,000 feet of elevation gain, then camp at Lake Frances. Trail report: muddy in places. Lots of new and often very wet spring growth (mostly thimbleberry-no thorns, though the flowers bore a clear resemblance to roses) to push through as we hiked. All the while, we sang Def Leppard’s “Rock of Ages”/the Smurfing Song/”Oh What a Beautiful Morning”/”Hi hello bear I’m here please don’t mind me walking through your backyard thanks verymuch…”, and we had two bear-spray cans at the ready. It was nice to discover that cooking/fire/food pole areas were set a distance away from sleeping areas. We picked the campsite (of two) closest to the trail that went down to the amazing lake. Day 4: Head back to the ranger station, then set out on a different trail to Kootenai Lake, about 2.5 miles out. Expect moose, mosquitoes. Trail/campsite report: No moose. An acceptable density of mosquitoes. Plus ducks, Trumpeter swan. I’m so glad I brought my binoculars! Over this trail there was also plenty of spring growth (this is what the ranger’s “brushy!” warning meant) reaching out over the trail. Hiking was muddy in spots: those in our group with non-waterproof boots had very wet feet! The camp area here had several campsites; only the newest one looked unfavorable as it still had a quite a bit of tree scraps covering the proposed tent pad. The 3-4 sites shared a cooking/fire area (fire was permitted at this lake, but not at Frances). Our backcountry adventure included no direct bear encounters but we did see fresh bear tracks on our trail – they sported the longer nails that tend to indicate grizz! Day 5: Head back to ranger station, get back on the ferry to Waterton, then drive back across the border and enter Glacier National Park. Check into Lake MacDonald Lodge to clean up, get a good night’s sleep. Day 6: Explore the park a little: take the shuttle back across Going-to-the-Sun Road (the most scenic drive I’ve ever taken) and do a little hiking and photography at Logan Pass. 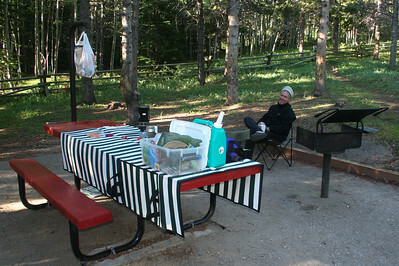 Head to Fish Creek Campground for one night of car camping. Site report: very spacious, and not far from the lake. 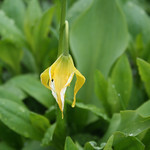 On this day we saw a black bear, hoary marmot, mountain goat, and some glacier lilies. Day 7: Check in at West Glacier with Glacier Raft Company, for a 2-day guided trip on the Flathead River. Trip report: terrific! But no bighorn sheep sightings. Day 8: Get out of the river, head back to Fish Creek Campground for another night. Site report: we picked a campsite closer to a creek, and enjoyed our last night of s’mores, our last night together as a group. The whole campground had just one set of showers, which had lukewarm water in the evening, but hot water the next morning. The construction we experienced on interstates last summer slowed us down a bit, and we suspected the scenery wasn’t optimal, either. This time, we planned to cross the Dakotas and Montana via a more northern route, on Highway 2. This was rewarding not only because there was minimal construction: we had less traffic, seemingly less speed limit enforcement, and terrific scenery. Also: on day one we visited some good friends in Fargo. We got into Montana early enough to pick a place to camp and explore before meeting Mike & Laura. Steve decided upon Alberta’s Writing-on-Stone Regional Park, just across the border and it delivered! We enjoyed a short hike among the hoodoos, petroglyphs and pictographs. 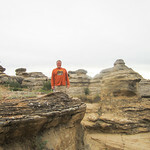 On the way back, our primary goal was to spend a little more time in the Bighorn Mountains of Wyoming. We drove through there maybe 10 years ago, a June trip, and the wildflowers were breathtaking. We checked out Medicine Wheel, along the northern stretch of the scenic byway. I didn’t know what to expect in terms of presentation or commercialization there but was pleasantly surprised by how subdued it was, having a ranger at each end of the 1.5-mile walk out to the circle. We then continued eastward to find lunch in Sheridan, then later stayed at a perfect little Forest Service campground on the southern stretch of the byway, Circle Park. We also wanted to spend a little more time in the Black Hills of South Dakota. In addition to visiting with Steve’s aunt and uncle, we ended up doing a short hike in Spearfish Canyon, to check out “The Devil’s Bathtub,” a waterfall/swimming hole. On our way out the next morning, we visited Wind Cave National Park, and did a shorter tour that revealed some of the “boxwork” limestone formations that are unique to this very large cave system. This idea worked so well last year that we did it again: we got back into Minnesota early enough that we picked a state park that was new to us, and enjoyed our last night of camping, relatively close to home. After departing I-90, it took over an hour of motoring down endless wind farm- and corn field-lined roads to get there, but Lake Shetek was worth the visit: cooler temps than we expected, and a nice nature hike awaited us in the morning. 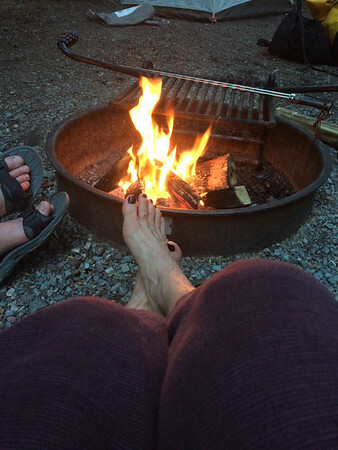 I wrote above about how much I loved campfires on this trip. Here’s a list of other Best Things about this trip. Best (and only) road trip conveyance: Osbert, Steve’s 2015 Mini Countryman. When we got to the Bighorn Mountains in Wyoming, we became aware that there was a biennial rally going on around us: Mini Takes To The States. We enjoyed swapping travel stories with a few other Mini enthusiasts, while stopping to photograph bison on our way to Wind Cave National Park. Some fun visual documentation of that event can be found in Instagram here. Best trip planner: my sister-in-law, Laura. Without her enthusiasm and diligence, we would not have scored the awesome backcountry permits and Park Lodge reservations. 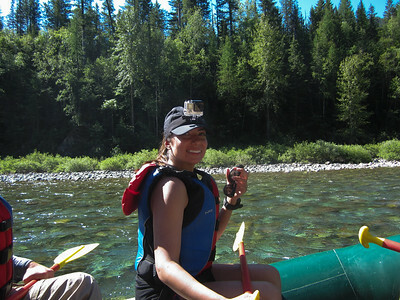 Best day: day 2 of our overnight rafting trip on the Flathead River. Because: bears! Bigger rapids! A terrific group of fellow river-rafters and guides! 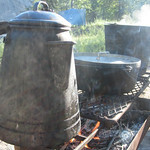 And waking up to the biggest, blackest pot of cowboy coffee brewing over a fire! Best animal: mink. At Lake Shetek State Park. Other good stuff there: pelicans and fireflies. Best new bird sighting: White-crowned sparrrow, seen at Logan Pass. We may have also seen a Northern Hawk Owl, from the Flathead River. Best human #31: Elizabeth, a fellow rafter! Best humans. Everyone we encountered on this trip was warm, friendly, helpful and positive. Fellow travelers, staff, restaurant servers… Especially these rangers: the one in Custer State Park that informed us about the Mini rally (“yes, there’s a rally passing through here, and you may want to go get your car washed…”), and the one at Lake Shetek who had to explain to us the new (and confusing as heck) campsite reservation system with Minnesota State Parks. All real-human interactions were such relief, so refreshing, especially as now and then, when cell service returned, our phones often imparted distressing push-notification news about violence at yet another location in the U.S., or about Donald Trump’s latest outrageous words or actions. Also in terms of thoughtful and skilled humans: we were very lucky to have such great river guides, for our overnight trip on the Flathead River. Cody and Colin were great at getting us safely down the river, with smiles on our faces, with new knowledge of the area and with fond memories of a terrific 30 our so hours on or near the bubbling, clear waters. Best food: The “french toast” my brother made, every morning while we car camped: English muffins or bagels, fried in butter. Using a Jetboil backpacking stove! The steaks served to us on the river trip were excellent, as well. Plus a chocolate cake (celebrating 1 rafter’s birthday and Mike & Laura’s anniversary) made in a cast iron Dutch oven. Best dangerous animal sighting: 4 black bears (including 2 cubs!). All seen from a vehicle moving forward and at a safe distance. Best otherworldly sights: tops of mountains getting hidden by swiftly moving clouds, especially up at Logan Pass. I’d start to set up for a photo and seconds later, the rock was gone. 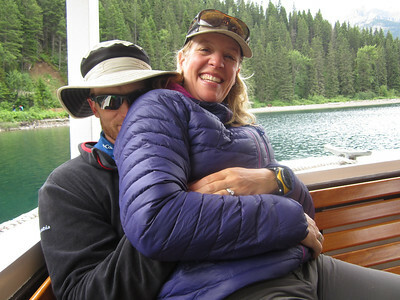 Best border crossing (Steve and I had six): our return to Canada from Goat Haunt Ranger Station, after the ferry ride. All we had to do -each of us, in sequence- was have a phone conversation with a customs/immigration official. We made sure to claim our bear spray cans! Best ultralight (AKA dehydrated) backpacking food consumed, either deep in backcountry or 5 feet from the Mini’s back bumper: Mountain House Breakfast Skillet. But only if you line your bowl with a corn tortilla, before eating it up. Best restaurant: Würst Bier Hall in Fargo. Because: porketta! And time to catch up with good friends. Best beer: Scottish 80D Ale from Gillette Brewing. Best campsite: Lake Frances. Well, the campsite itself wasn’t all that remarkable but it had great access to the phenomenal lake and waterfall. Next best campsites: all of them that had streams running by or through them: in Fish Creek campground, and at Circle Park. Best camping equipment item that we don’t own: the huge waterproof sleeping pads supplied by the Glacier Rafting Company on our Flathead rafting trip. And their huge tent, too. These together made our outdoors sleeping experience most like a queen bed. Best camping equipment item that we do own: the 2 folding chairs Ford sent me 6 months after I bought my Explorer, back in 1997. These offered much more comfy campsite seating than picnic benches! This choice does not appear to offer resounding accolades for our first backpacking experience in many years (the chairs didn’t fit into our packs), though we did have a successful 3-day backcountry adventure in Glacier and Waterton Park, thanks in no small part to my great (and free! From my fit-testing days) leather Vasque backpacking boots. I had feet so dry that I didn’t even need to change socks! Also, we love our lightweight Big Agnes Copper Spur UL2 tent even more now that we’ve enjoyed a few cooler-than-Grand-Canyon nights in it. Also beloved after dinner at Lakes Frances and Kootenai: my small flask of bourbon (in it a mix of Woodford Reserve, Old GrandDad, and Buffalo Trace, all left over from our Derby Party in May). Best item not forgotten and yet used only during first half of the trip: the AirCast (orthopaedic) boot prescribed to me for my running-related stress reaction/fracture. Hiking boots were, I was told, an appropriate substitute (as long as I wasn’t running in them), and for the rest of the time we were driving or shuffling around a campsite. 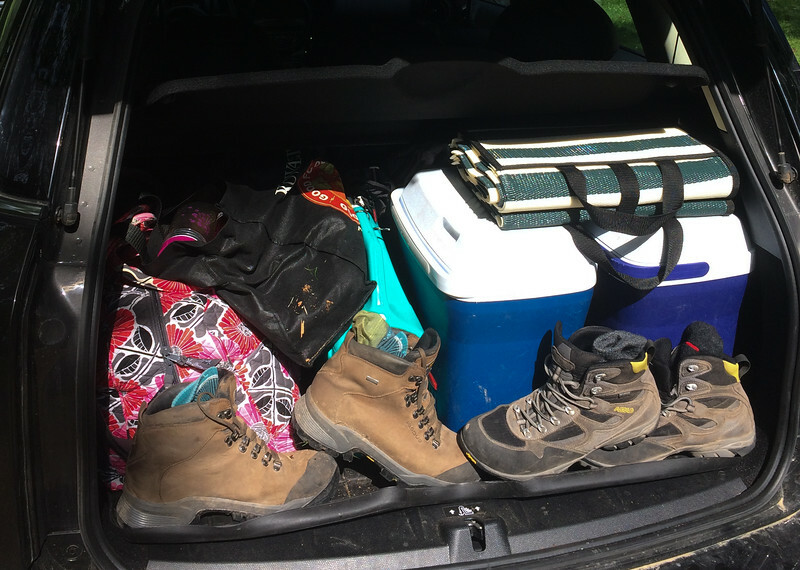 Living out of a trunk for 2 weeks: my terrifically waterproof boots, at left! And that’s a wrap. We haven’t decided where to go next as a group but we will go somewhere wild, for sure. Maybe the Everglades? I just read this terrific article on Gary Snyder from a few years back, and I’d like to share it: The New Yorker’s Zen Master: Gary Snyder and the Art of Life. The poem above receives its proper indentations, in this article. Enjoy! Want more photos? I’ve got over 200 here in a SmugMug.com gallery. This I edited down from at least twice that many! Arah, you have a story telling gift. I’m so proud to say you’re my friend. Your adventure sounds wonderful. Thanks for sharing! Love you. Your reading it -and this compliment!- mean so much to me, Gayle! And you are so sweet. Love you, too! I absolutely loved reading this blog post, Arah! Three takeaways… 1) I want to go there and do that, 2) You guys seem to be living right with fulfilling people, places and experiences, and 3) You worked in the term “push-notification” like it was the way everyone thought/talked/experienced their phone blowing up with messages. Well done. Elmer! Well, thank you so much. I’m glad you liked it! I think the only thing the trip lacked was my VitaMix, so that I could make bulletproof coffees for us all each morning. As it is, I make one every few days at home and it always reminds me of you. Cheers!